Vintage, Wedgwood Cut Crystal , 7" Round, Serving Bowl, in Pattern #WWC1, Circa 1950's. Vintage, Wedgwood Cut Crystal, 7'' Round, Serving Bowl, in Pattern #WWC1, Circa 1950's. 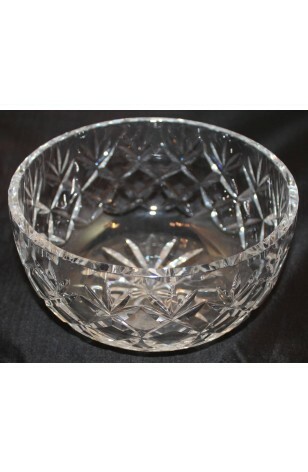 A beautiful Cut Crystal, 7" Round Serving Bowl by Wedgwood Crystal in Pattern #WWC1. This gorgeous Crystal Bowl has "X" Cuts, with 3-Point Fans above. Extremely Attractive with Scalloped Rim. Excellent Crystal Sound as well. The Bowl is 3 1/2" Deep, so can easily be used as a Salad or Fruit Bowl, etc... Very Decorative, in Very Good Resale Condition unless noted below or seen in pictures. 1 - Crystal Bowl - 7" Round x 3 1/2" Deep - Serving, Salad, Fruit, etc..